The Grove - ±5A DC/AC Current Sensor (ACS70331) is a high precision DC/AC current sensor based on ACS70331. The ACS70331EESATR-005B3 is Allegro’s high sensitivity,current sensor IC for <5 A current sensing applications. It incorporates giant magneto-resistive (GMR) technology that is 25 times more sensitive than traditional Hall-effect sensors to sense the magnetic field generated by the current flowing through the low resistance, integrated primary conductor. The Grove - ±5A DC/AC Current Sensor (ACS70331) can measure both the DC current and the AC current up to 5A with a base sensitivity of 200mV/A. The human body is forbidden to touch the module during the test, otherwise there is danger of electric shock. 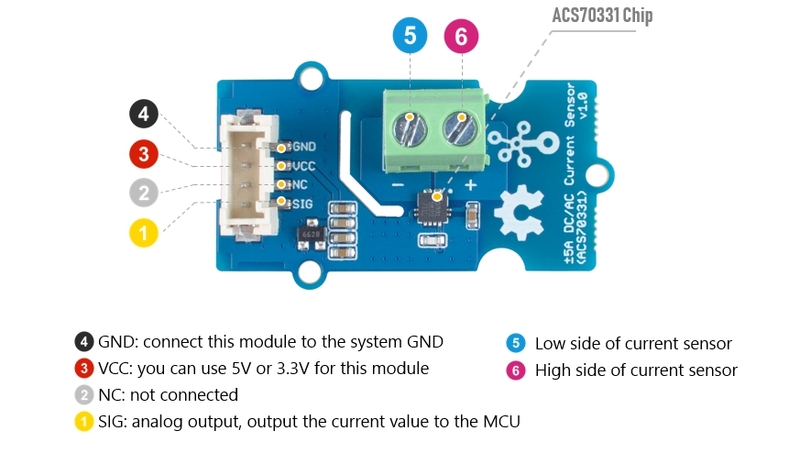 The Grove - ±5A DC/AC Current Sensor (ACS70331) can measure both the DC current and the AC current up to 5A.